​Earlier this month, Hurricane Michael—one of the four strongest storms in U.S. history—caused widespread devastation, severe property damage, and immense human suffering across six states. Just one week after Michael made landfall, impacted electric companies had restored power to more than 2.6 million—or 95 percent of—customers impacted by this catastrophic storm. In the most heavily damaged areas, affected electric companies focused their efforts and resources on rebuilding the energy grid from the ground up. The most severe damage to infrastructure, requiring the most extensive rebuild and restoration work, was in the Florida Panhandle, where workers faced catastrophic damage and challenging conditions. ​Electric companies mobilized an army of more than 35,000 workers from at least 27 states and Canada to restore power safely and as quickly as possible. This workforce included crews and support personnel from affected companies, contractor resources, and additional workers from mutual assistance partners outside the impact area. Mutual assistance, a hallmark of the electric power industry, allows companies to share skilled restoration personnel and equipment. Strong industry-government coordination is critical, and, during and after Hurricane Michael, the CEO-led Electricity Subsector Coordinating Council was engaged to ensure unity of effort and unity of message across the highest levels. 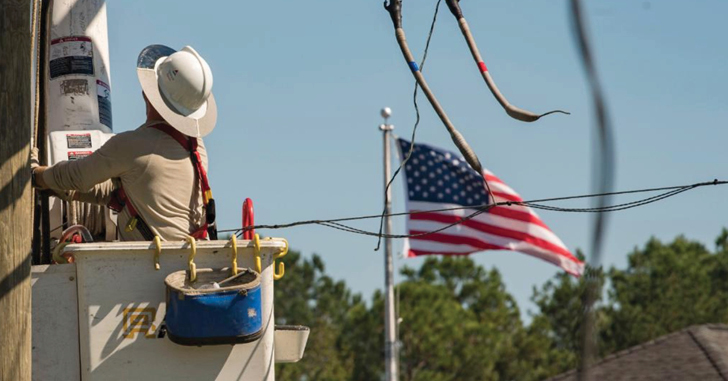 As always, we are profoundly grateful to the heroic men and women who worked and who continue to work around the clock to restore power and to rebuild the energy grid—and to restore hope to the customers and communities they serve. See more on the industry’s response at EEI’s Michael webpage​. ​Congress recently passed several bills with provisions critical to the electric power industry and its customers. The Federal Aviation Administration (FAA) Reauthorization Act of 2018 (H.R. 302) extends the authority of the FAA for five years and includes many provisions related to drones or unmanned aircraft systems (UAS). It includes a Sense of Congress resolution highlighting the importance of using drones following natural disasters, and directives to the FAA to complete rulemakings regarding protection of critical infrastructure and promotion of advanced drone operations including flights beyond visual line of sight. (See how electric companies are using UAS below​ and in EEI's video​.) H.R. 302 also includes reforms to federal disaster programs, provides $1.68 billion for Community Development Block Grants to assist victims of Hurricane Florence, and promotes electrifying equipment and the use of alternative fuels at airports. Among the most critical provisions of America’s Water Infrastructure Act of 2018 (S. 3021) are sections that permanently extend the authority for electric and natural gas companies to contribute funds to the U.S. Army Corps of Engineers to expedite the evaluation of permits related to infrastructure projects. The bill modernizes authorizations for certain routine hydropower permits and deadlines, and it promotes hydropower development at existing nonpowered dams and the construction of pumped hydropower energy storage. ​Throughout Careers in Energy Week—October 15-19—EEI showcased how electric companies are supporting employees today and are working to create a strong, skilled, and diverse energy workforce for tomorrow. Careers in Energy Week was created by the Center for Energy Workforce Development (CEWD) and its members to celebrate and raise awareness of energy careers and their importance to communities, states, and the nation. The electric power industry supports more than 7 million jobs in communities throughout the country—that’s 1 in every 20 American jobs. In 2015, median annual wages for electric power industry jobs were $73,000—double the national median. Through CEWD and partnerships with educational institutions, public workforce systems, and organized labor, the industry is supporting employees today and is building tomorrow’s energy workforce. CEWD members are driving new skills training, advancing STEM education, and creating resources tailored to veterans, women, youth, and adults. distributing classroom materials focused on energy to schools. Read more in Energy Talk In Depth​. ​Electric companies are America’s energy storage leaders—they own, procure, or utilize 98 percent of all energy storage in the country, according to a new report from EEI. While pumped hydropower comprises the lion’s share of operational energy storage today—92 percent—battery storage is the fastest growing energy storage technology. In 2017, batteries accounted for 54 percent of all non-pumped hydro energy storage capacity. The report outlines how owning energy storage provides electric companies with options that enhance flexibility and service for customers. According to the report, “Electric company-owned energy storage is a true win-win for customers and the energy grid.” Energy Storage Trends and Key Issues​ includes an overview of state policy developments affecting energy storage and examples of EEI member company storage projects. Learn more about how electric companies are using energy storage to benefit customers on EEI's website​. 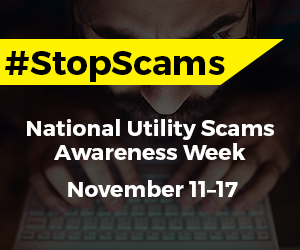 ​October is National Cyber Security Awareness Month, but securing the nation’s energy grid is the electric power industry’s top priority all year long. Electric companies proactively safeguard the energy grid to help ensure a reliable and affordable supply of energy for customers. To address hazards that could impact the energy grid’s complex and interconnected technologies—including malicious, man-made cyber and physical attacks as well as a variety of natural disasters—the electric power industry is working hard to enhance the resilience of the energy grid and to accelerate recovery from potential incidents. efforts to prepare, respond, and recover should an incident impact the energy grid. The electric power industry is subject to mandatory and enforceable reliability standards that include cyber and physical security mandates. Regulations and standards provide a solid foundation for strengthening the industry’s security posture, but, given the dynamic threat environment, the industry’s efforts move beyond them. Electric companies tailor security programs to their unique operating and business environments, and they coordinate with the Electricity Information Sharing and Analysis Center (E-ISAC); federal agencies including the Department of Energy, Department of Homeland Security, and the FBI; and state governments to identify and mitigate threats. working closely with other interdependent infrastructure sectors (communications, downstream natural gas, financial services, and water) to ensure all are prepared for, and can respond to, national-level incidents. Read the ESCC’s factsheet. 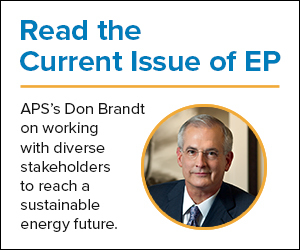 Learn more in EEI’s grid security key messages​, factsheet, and Energy Talk In Depth​. ​“The lessons are clear. To build a better, cleaner, and sustainable energy future for Arizona and the nation, we cannot follow the policies of the past,” writes Don Brandt, chairman, president and CEO of Pinnacle West and Arizona Public Service, in Electric Perspectives. Which resources have the best potential to lead us to a greatly reduced carbon future? What is the best mix of energy resources and technology to maintain and improve reliability? 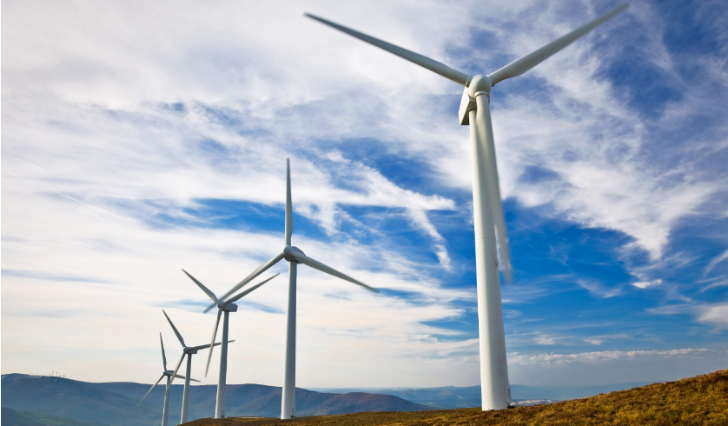 What is the best course to follow to provide cleaner energy at a fair cost to customers? ​As Americans prepare to go to the polls on November 6, it’s essential for voters to be aware of candidates, deadlines, registration information, absentee voting rules, polling locations, and other details specific to their jurisdictions. EEI’s newly relaunched election website, EEIvotes.org​, provides a convenient way for electric company employees and customers to obtain key voting information. ​Electric companies invest more than $100 billion each year to build smarter energy infrastructure and to transition to even cleaner energy resources. Because many of the industry’s investments are in assets with long service lives—often 40 years or longer for transmission infrastructure—it is vital that policies promote predictable and stable returns on equity (ROE) to investors. According to a new EEI whitepaper, the Federal Energy Regulatory Commission (FERC) should discontinue its practice of allowing multiple transmission rate complaint cases, often known as “serial” complaints, or “pancaking,” which can result in these cases taking longer than the statutorily required 15-month period. FERC’s recent practice of setting virtually all ROE complaints for hearing has resulted in nearly seven years of rate uncertainty for transmission-owning electric companies and their investors. Numerous complaints have been filed, and few have been resolved. This situation could erode the confidence of investors in FERC-regulated transmission assets, which threatens the ability of electric companies to cost-effectively access capital needed to maintain and expand a robust, reliable, and resilient transmission grid. In orders issued in October, FERC took a positive step toward addressing pancaking, consistent with the recommendation in the EEI whitepaper. In particular, FERC announced that it would make a determination about whether a challenge to an ROE is valid before sending it to a hearing. How this will work in practice will be important, and EEI and member companies will continue to engage with the Commission on this issue. ​In the latest issue of Electric Perspectives, take a look back at EEI’s 85 years of representing America’s investor-owned electric companies. 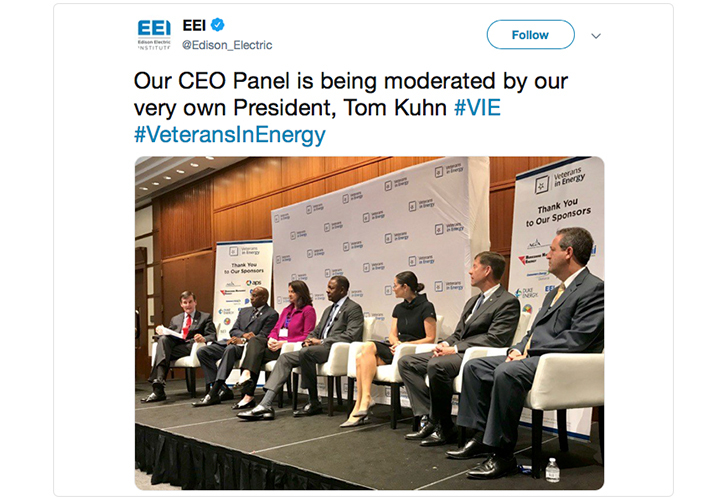 “For all the change we have seen, one thing remains constant: our commitment to delivering the safe, reliable, affordable, and increasingly clean energy customers need,” writes EEI President Tom Kuhn. ​“We are working closely with industry to better understand vulnerabilities in systems and related consequences; characterize the corresponding risk across the national landscape; and collectively develop industry-focused strategies to create asymmetric defensive advantages,” writes Christopher Krebs, Undersecretary of the National Protection and Programs Directorate at the Department of Homeland Security, in Electric Perspectives. ​Recently, EEI released the first and only industry-focused and investor-driven environmental, social, governance, and sustainability-related (ESG/sustainability) reporting template to benefit electricity customers and to help provide the financial sector with more uniform and consistent ESG/sustainability data and information. EEI’s template is helping to showcase the efforts of companies like Duke Energy, which participated in EEI’s pilot ESG/sustainability reporting project last year. Duke is executing its strategy to create a cleaner energy future for customers by investing $25 billion over 10 years to modernize the energy grid by deploying smart meters and other technologies that enhance reliability and resiliency, enable greater efficiency, and support more renewable energy resources; investing $11 billion in cleaner generation technologies that include natural gas, hydropower, wind, and solar; and providing customers with innovative solutions that give them more options and greater control over their energy use. ​The company has lowered its carbon dioxide emissions 31 percent from 2005 levels and plans to reduce them by 40 percent by 2030. Duke Energy also has decreased sulfur dioxide emissions by 96 percent and nitrogen oxides emissions by 75 percent. Duke Energy now owns or contracts for more than 6,400 megawatts of wind, solar, and biomass capacity. Duke Energy is working with its customers to reduce their energy consumption by 15,000 gigawatt-hours by 2020, enough to power 1.25 million homes for one year. The company met its goal to recycle 80 percent of its solid waste one year earlier than planned. Learn more about how electric companies are leading on clean energy in EEI’s infographic​. ​Nationwide, electric companies use drones, or unmanned aircraft systems (UAS), to help maintain and inspect their critical energy infrastructure, including more than 45,000 electricity substations and approximately 400,000 miles of transmission lines. UAS enhance the resiliency and reliability of the energy grid by allowing electric companies to assess damage from natural disasters safely and quickly, helping to speed service restoration; to identify potential issues before they become a problem; and to add another layer of security to the energy grid. “Leading the development of unmanned aircraft builds on our longstanding commitment to safety for our workers, the public, and the environment. This is especially important in Colorado, where inspecting power lines in the mountains and remote locations is challenging work,” said David Eves, executive vice president, group president-utilities, Xcel Energy. Xcel Energy has collaborated with the FAA for several years and has contributed to the development of operational and safety requirements for UAS operations in the energy industry. Last year, the company entered into a Partnership for Safety Program with the FAA to facilitate safe and routine beyond line of sight drone operations into the National Airspace System that would support monitoring, inspecting, and sustaining the energy grid.